Twilight Cartoon Characters. . Wallpaper and background images in the Twilight Series club tagged: twilight edward cullen movie cast. I like these :D Awesome! i luv these cartoon characters but i luv jacob and bell better than the rest of the characters. nice i like them a lot! this picture is so cool i loved it soooooooo much!!!!!!!!!!! so cute- what's next a cartoon ? i hope so ! 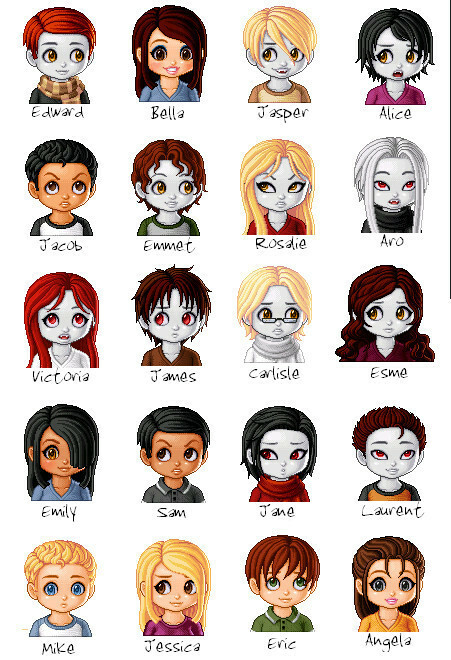 this is cute especially edward!! i love love love love this its soooooooooooooooooo funny!!!! Emmett doea not have red hair he has short black hair. Alice is not that pale. Carlisle does not wear glasses. i love it but.. fix edwards hair!!!!! how could they not do bella? I like it! But Edward's hair is the only thing that is different. aww so cute! but why is Ed ginger ? it's so cute...especially bella and edward... :-) team robsten!!! yeah! were do u make these? omg what dressup game is this from? I've played it before and i made a girl that looked like she was mad lol what is the name of it?